.... had a super time wandering along the mighty Nepean River this morning while the boss had other business!! Amazing how the weir level is showing how dry it has been, even with all the recent rain it is still struggling to crest the main weir wall. 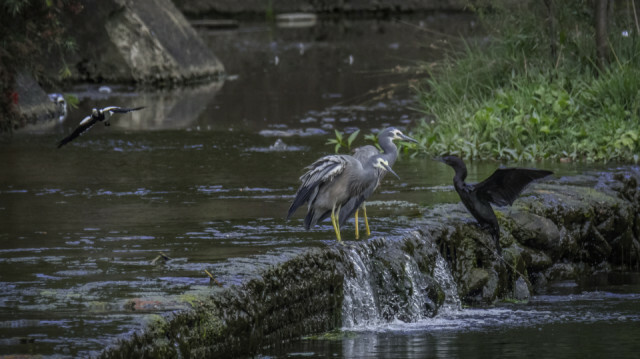 Found this pair of Herons "fishing" on a section of the weir with the pee wee, when up flopped the shag causing the pee wee to take off! Had a few other shots on FLICKR starting here - but if not time just check this one of the bee having lunch and along comes a stingless bee and gives it a nip on the "oops"!! Really happy with the result here as I was about 25 metres away so the "big gun" in low light did a pretty good result - you can also note the bee hanging on for grim life! !